A few months ago, I put the Dose of Colors Eyedeal Duo in Maple on a wishlist and I finally got it during their 30% off anniversary sale! 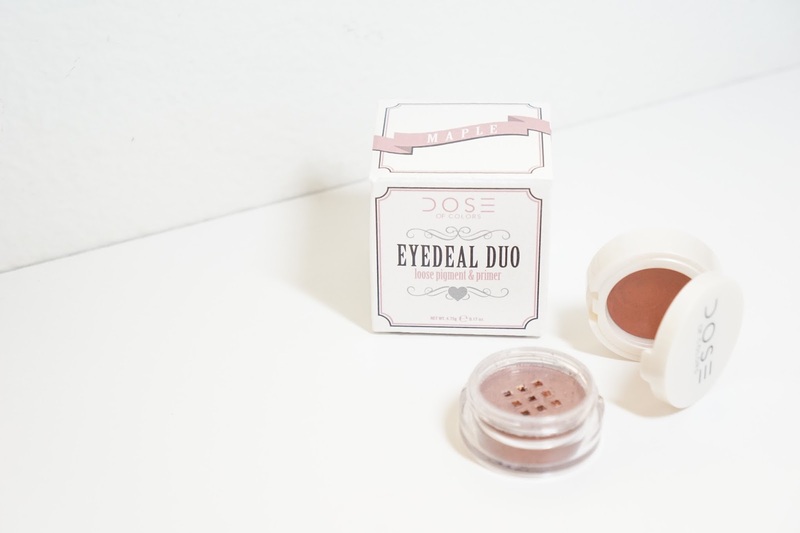 The Eyedeal Duos are a two part product that contain a cream base/primer and a loose pigment. A mini mirror is also included on the lid of the primer portion of the packaging. Both parts of this duo are on the warm brown side but the cream is more red and the pigment is more copper. There is 4.75 grams / 0.17 ounces of product total and it retails for $25 on the Dose Of Colors website here! The cream base/primer wasn't as sticky as I thought it would be (left picture). 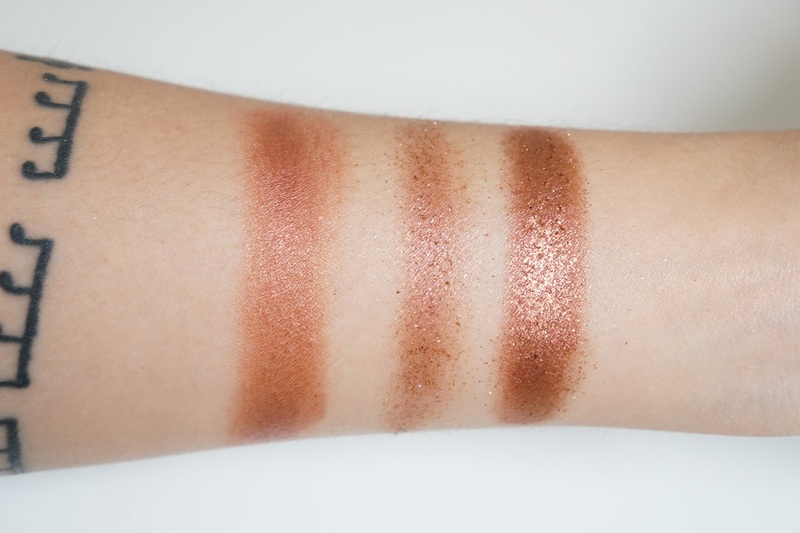 My only other experience with dual products like this is the Estee Edit Metallishadow Creme + Powder in Scarlet Eclipse (review here) and the cream base was so much tackier and harder to work with. The DOS cream base is creamier and blends out easier, but it isn't as creaseproof. For the pigment (layered on top of the cream on the right picture), you need to have some kind of base to make it stick or maybe a spritz of a spray like MAC Fix+. It didn't grab onto my skin or the other part of the duo that well without a lot of fall out and so I had to be really careful to pack it on. Once I do get both products on my eyes, it is very pretty with the perfect amount of shimmer. The base by itself leans almost too warm and red, but the coppery pigment makes it easier to wear for me. Both shades compliment each other, but I wish they would've been more different. I feel like one part of it could've been more neutral so that the overall look could be more wearable for other people that aren't into overly warm shades. Personally, I'm a huge fan of warm tones and so this did fit into my collection pretty well. Unfortunately, I did see creasing when I wore this product. When I did the above looks with this product, I also saw some transferring onto my top lid above my crease as well. Primer and maybe a powder eyeshadow to set the base would probably help, but it's kind of disappointing since the base is supposed to be a primer. I've tried adjusting the amount of base I used too and the results were the same. Final thoughts: I like the look it creates, but I wouldn't recommend it. It's pretty disappointing to me that a cream primer would still lead to creasing. The loose pigment was also more challenging to work with and lead to a lot of fall out if I wasn't careful. Now that I have it, I'm still going to use it but I'll probably have to pair it with better primers and pigments to make sure it looks good all day. It's not a horrible product and I'm still going to use it, but I would rather buy a separate cream shadow and loose pigment to get a better result. Side note - their Hidden Treasure palette though! I'll try to do a review on it, but the shadows in that palette are so much better than this pigment. Have you tried Dose of Colors? What do you think about their products? What do you think about duo products like these?